It’s the most wonderful time of the year! That’s right – con season. And con season officially kicks off whenever Origins Game Fair rolls around in Columbus, Ohio. 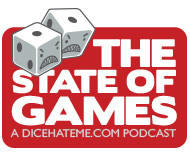 This year was even bigger and better than last year; the crowds were up, the games were plentiful, and the Dice Hate Me Games booth was totally rocking. Come on in and check out all the hip happenings at our summer home away from home. So honored to hear Stab a Panda mentioned! Thanks guys. I always enjoy listening to this group of guys, and having Matt & Ben on makes it even better. Thanks for the invite to come on and jibber jabber. Had a blast. You guys are always fun. Can’t wait until Gencon.